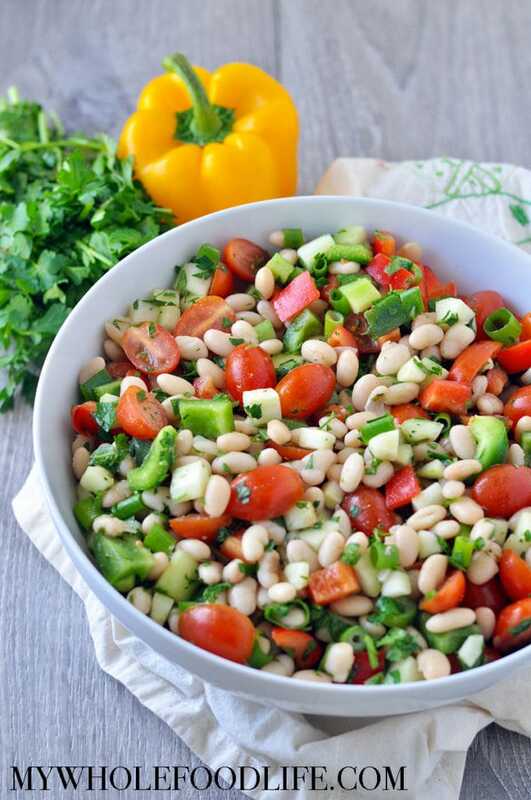 This Super Easy Bean Salad is one of the first things I made when I started making my own food. My mother-in-law is Turkish and she was the one who introduced me to it. It’s so easy and a great way to get lots of veggies in your diet. I love making it with my 3 year old daughter because she will munch on the veggies as she helps throw them in the bowl. That’s a mom win! For more salad ideas check out this post. I usually make a huge amount of it because it goes fast in our house. I use dried white beans because they are cheaper than canned white beans and they taste clean without that gross aluminum aftertaste. All you need to do is soak them overnight and then boil them on the stove until they are soft. I also usually play around with the seasoning amounts. Feel free to add more or less to fit your tastes. I love cumin and that is why I add a good amount. Non vegans, feel free to add feta cheese in there too. This dish is served at almost all our family functions. It is a favorite with almost everyone. I hope you enjoy it as much as we do! I filmed a video for this recipe as well. You can view it below. For more videos, you can subscribe to my You Tube Channel. 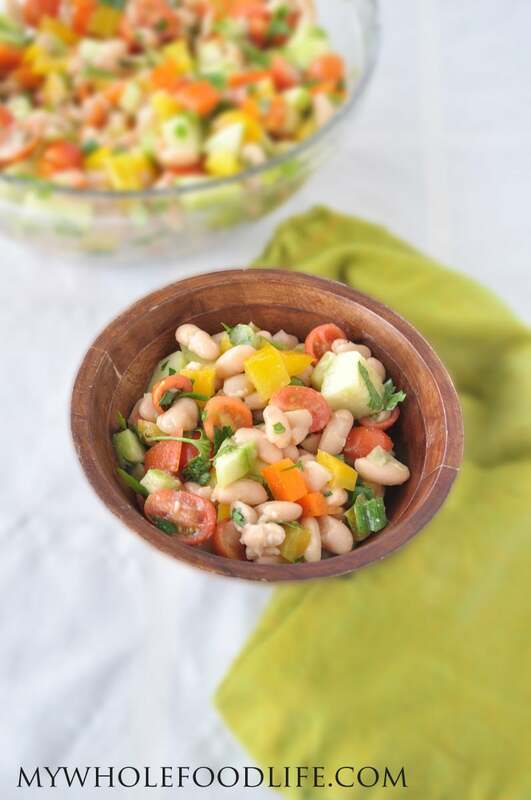 This healthy white bean salad is super easy to make and always a crowd-pleaser. If you use dried white beans, like we do, soak overnight first. Rinse, drain, and boil to soften. Rough chop the bell peppers. Peel, de-seed, and chop the cucumber. Add everything to a mixing bowl and stir. For non-vegans, some feta cheese goes real well with this dish too. So glad you liked it Celine!! This was by far the best tasting salad with beans in it I have ever had. My husband, being from the South loves anything with beans in it. It was light and the dressing made it very tasty. He added tuna to his and I added baked cooled squash to mine. Very, very tasty.